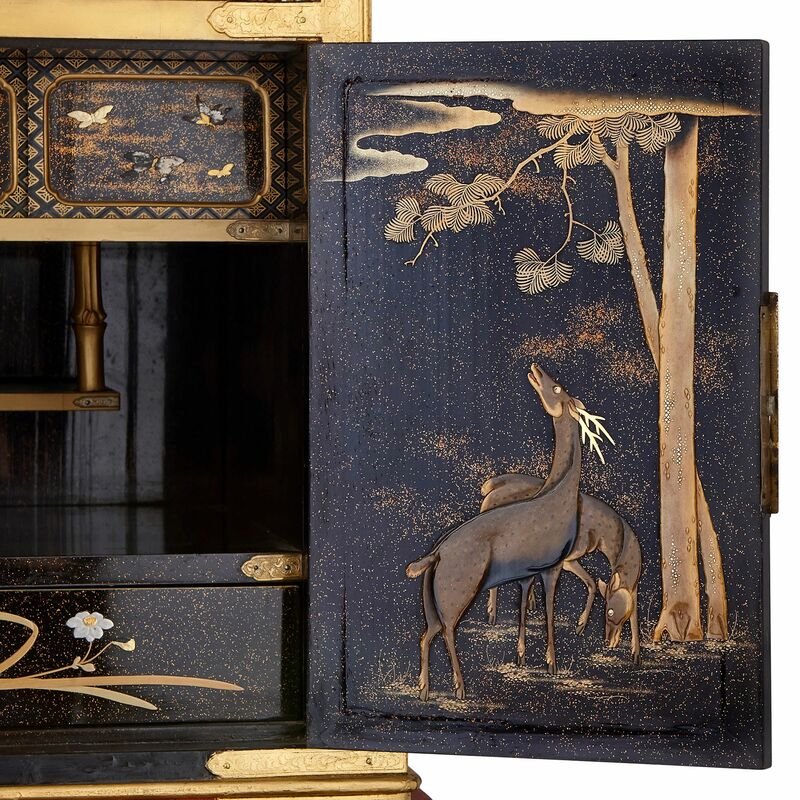 This remarkable Japanese lacquer cabinet features exquisite maki-e depictions of native plant and animal life, and traditional religious and ceremonial subjects. 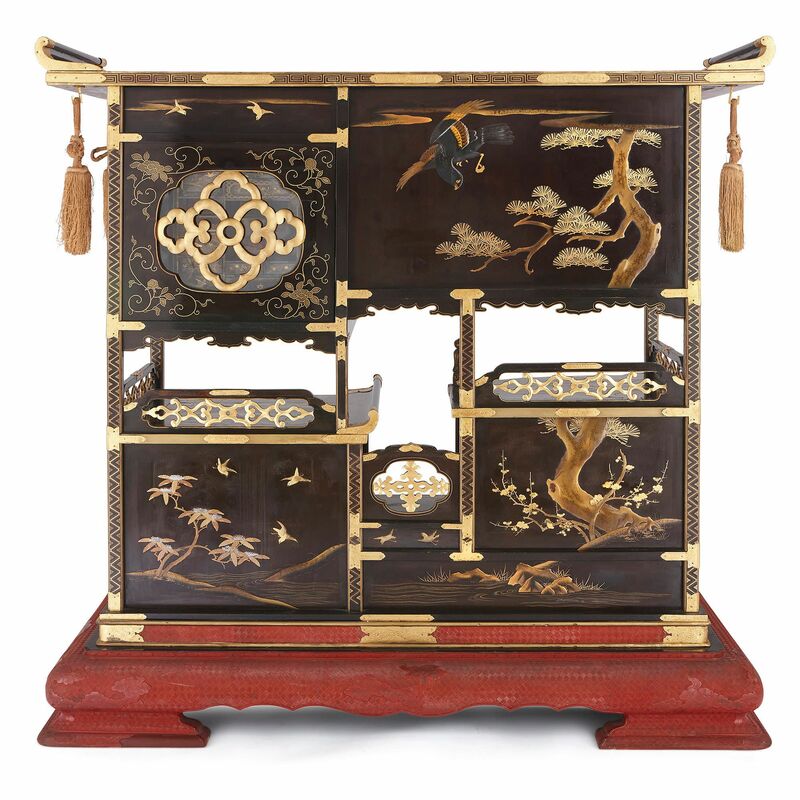 The kazaridana (display cabinet) stands on a red lacquer (tsuikin) base, with a shaped apron, on four bracket feet. Above, the cabinet body is longitudinally divided in half, with the upper and lower sections separated by a gap in the middle. The cabinet levels are staggered and the different compartments are arranged asymmetrically. These vary in size and shape, from long rectangular drawers, to square-fronted cupboards, and an angular compartment on the bottom left. 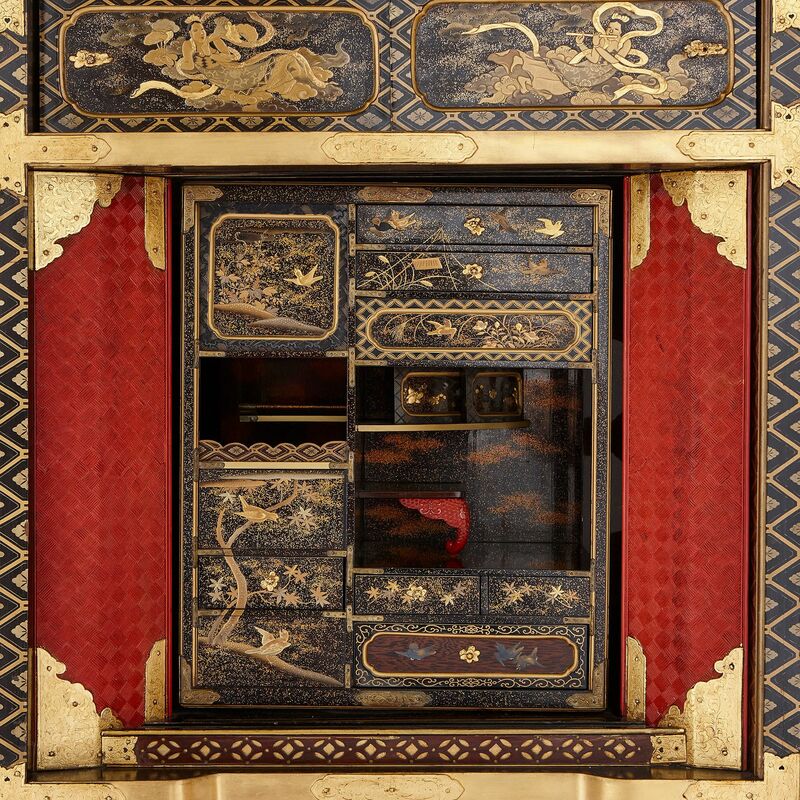 While most of the drawers have black lacquered fronts, the top right cupboard facade has been crafted from red lacquered wood, and features a central glazed four-lobed flower motif. Each of the cupboards opens onto a series of small drawers and compartments, which are as intricately decorated as the main cabinet facade. 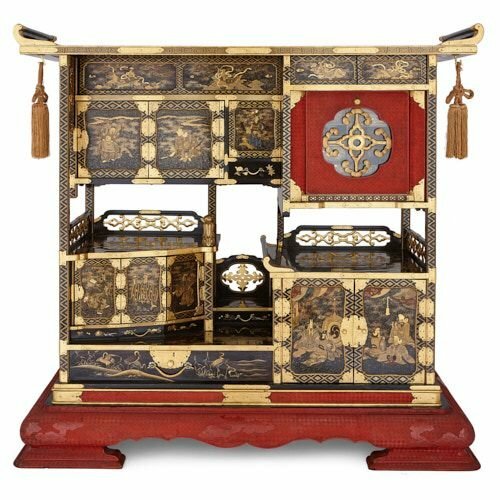 In its overall form, the cabinet synthesises the traditional three types of Japanese ornamental shelves, which are collectively known as the ‘san-dana’. These three units are individually named, the ‘zushi-dana', ‘kuro-dana’, and ‘sho-dana’. They were originally exclusively used by the social elite, often gifted to couples on their wedding day. 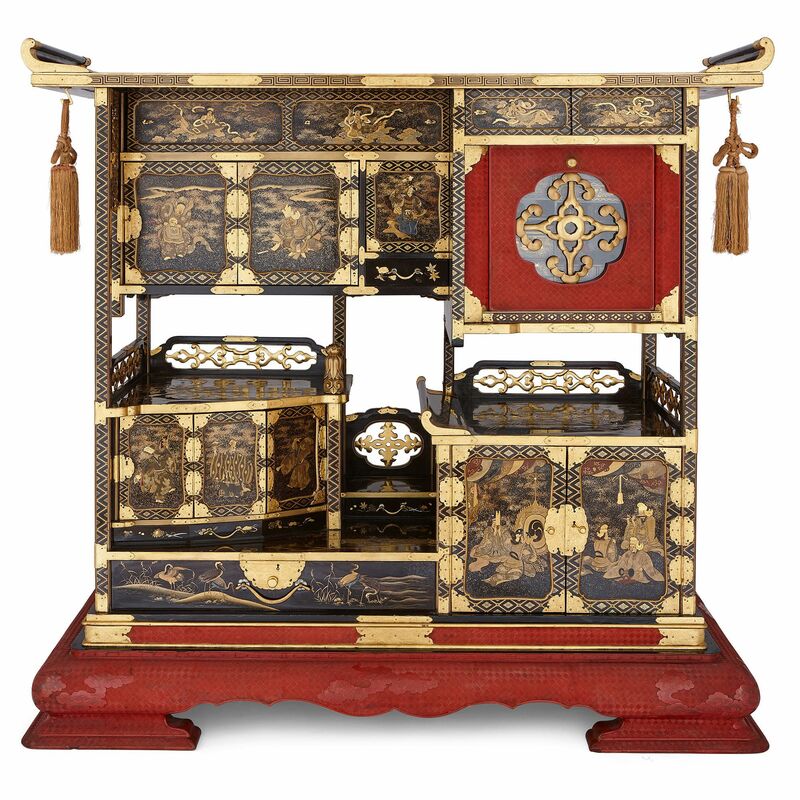 The cabinet also quotes other pieces of Japanese furniture. The curved roof wings, for instance, are taken from the benches used to lay, unroll and read the sacred volumes (kyézukue). The two faded red tassels that hang from the ends are original to the piece. In its structure, the cabinet eclectically combines historic types of Japanese furniture. The top of the cabinet, the sides, back, lower front drawer and interiors of the cupboard doors are ornamented with traditional images of birds and flowers (kachéga). These include cranes, butterflies, a pair of deer, a hawk, an eagle, waterfowl, as well as cherry blossom, pine and plum trees. 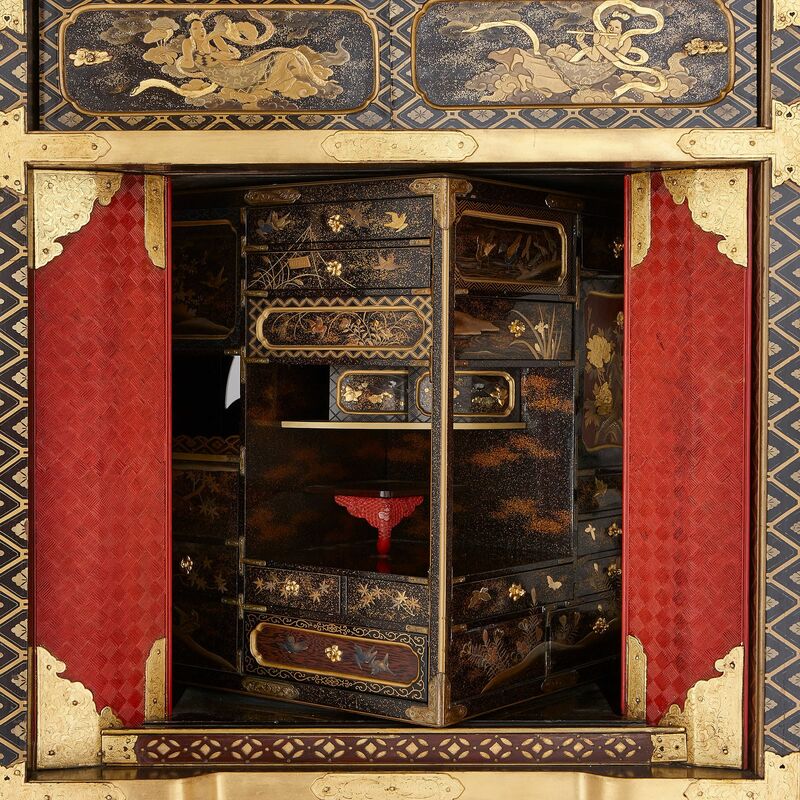 The uppermost section of drawers of the front facade depicts four ‘tennin’ — that is, celestial Buddhist nymphs — represented in flight. From left to right, one is depicted playing the koto, another the drums, one carries lotus flowers, and the fourth plays the flute. These last two doors slide to open. 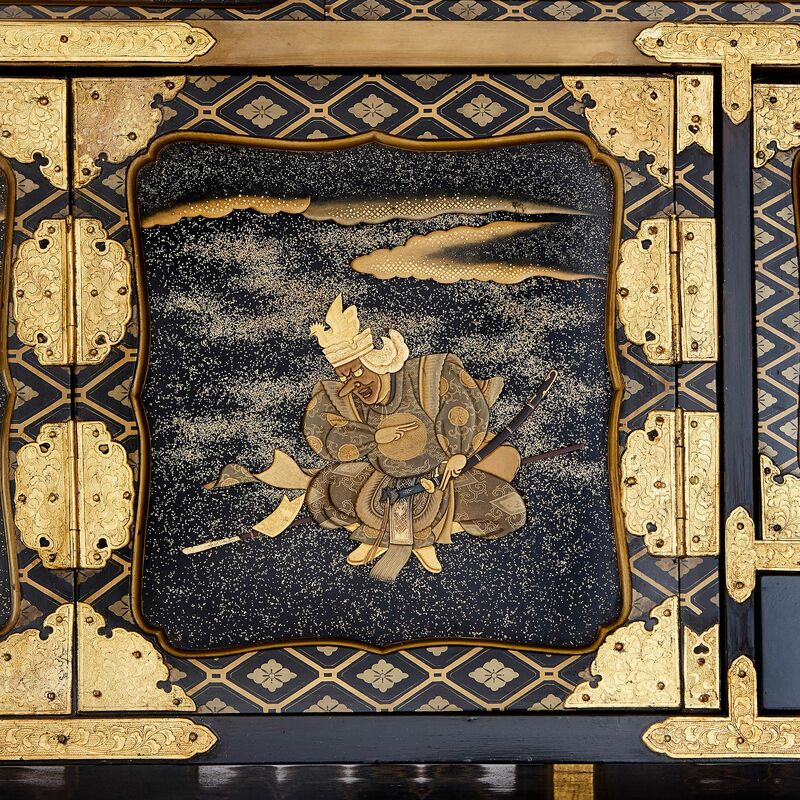 Below them, the cupboard doors depict dancers and musicians of the Japanese court and New Year celebrations. The six left-hand cupboards below depict ‘Bugaku' dancers, wearing elaborate costumes, masks and headdresses. The right-hand figure on the top row depicts a young male dancer wearing butterfly wings (Hoche koché). 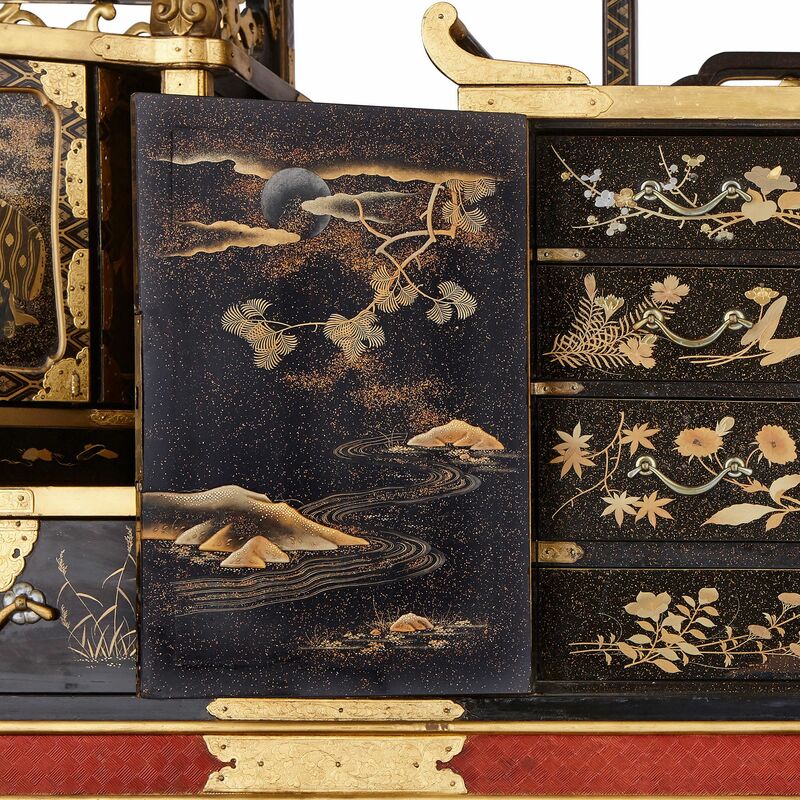 The bottom right compartment shows five seated court musicians, called ‘Gagaku’. These musicians have been a part of the imperial court since ancient times. 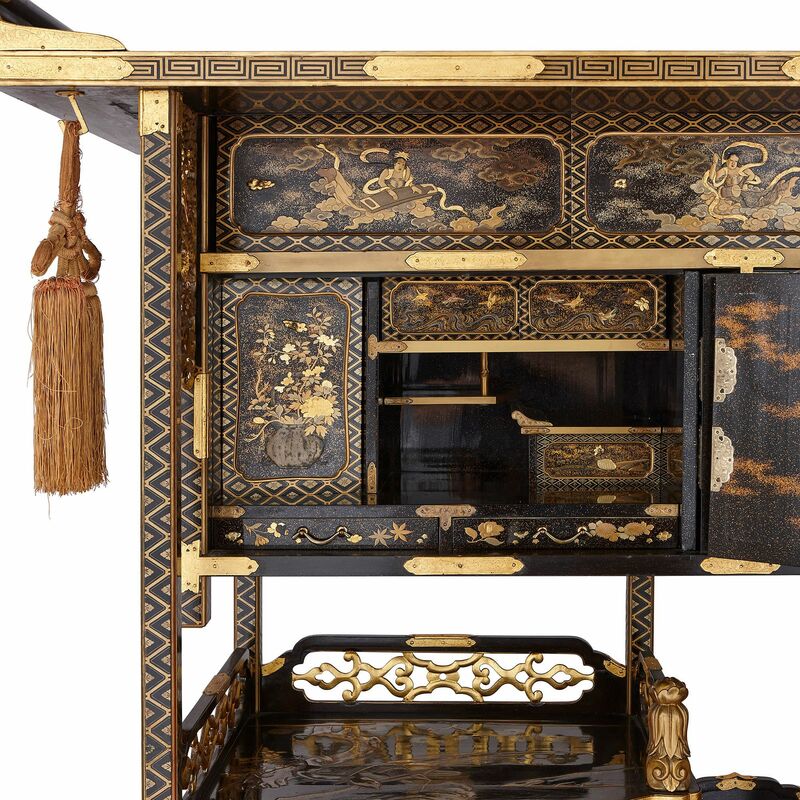 In its ornament, the cabinet brings all of Japanese religion, culture and nature together in one place. 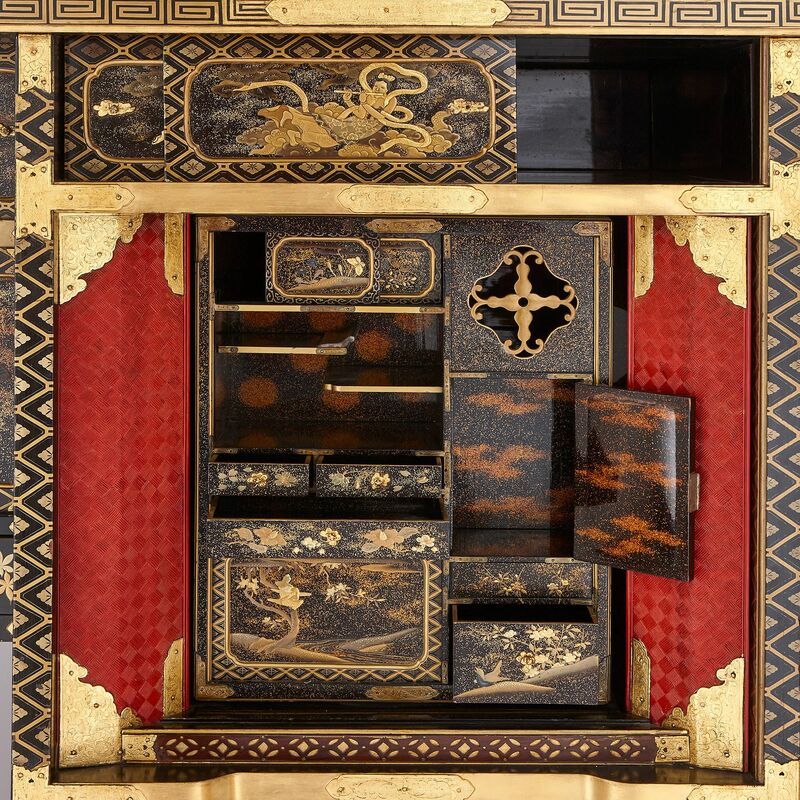 This cabinet belongs to a category of Japanese lacquerware known as ‘okoyamono’. Furniture within this category is defined by its creative eclecticism, in both its structure and ornament. 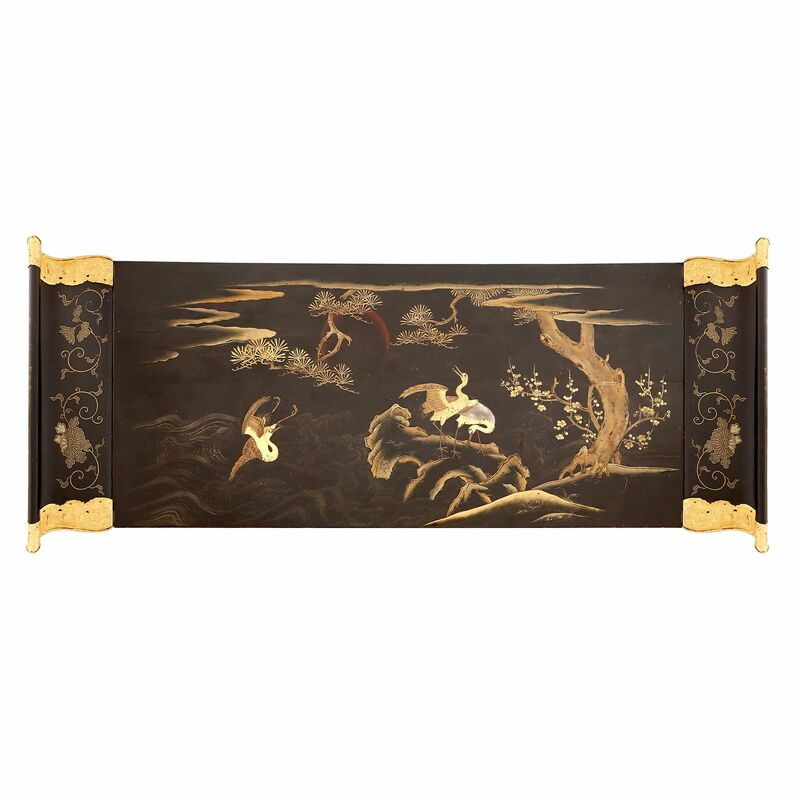 The cabinet body is covered with black lacquer, and decorated with intricate ‘maki-e’ scenes. 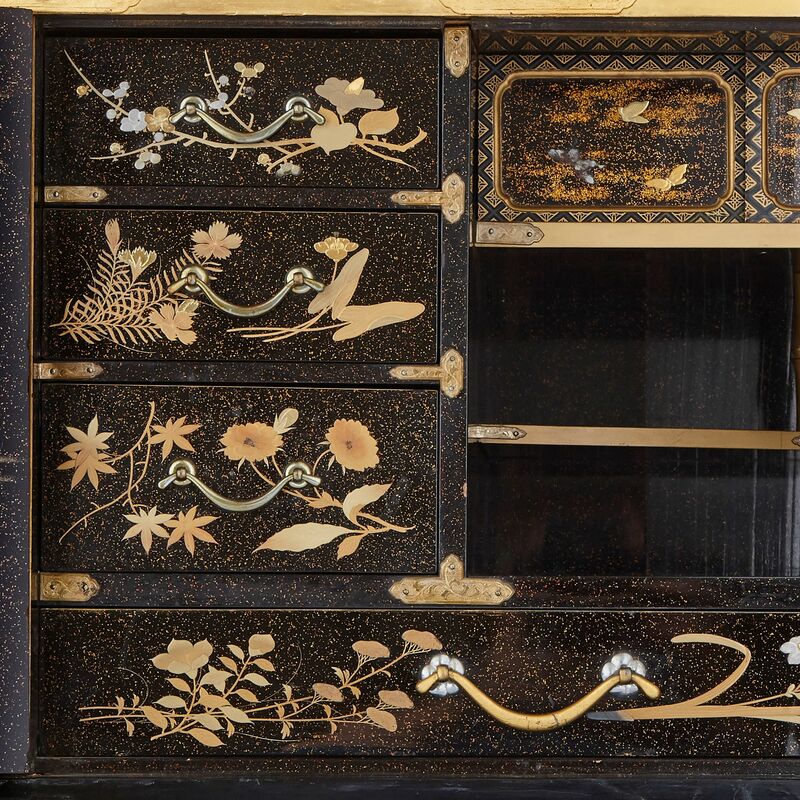 Maki-e is a technique which has been used in Japan since the 9th Century, In this process, metallic powders (gold, silver, copper, brass, and more) are applied to the black lacquer surface using bamboo straws and soft brushes of varying sizes. 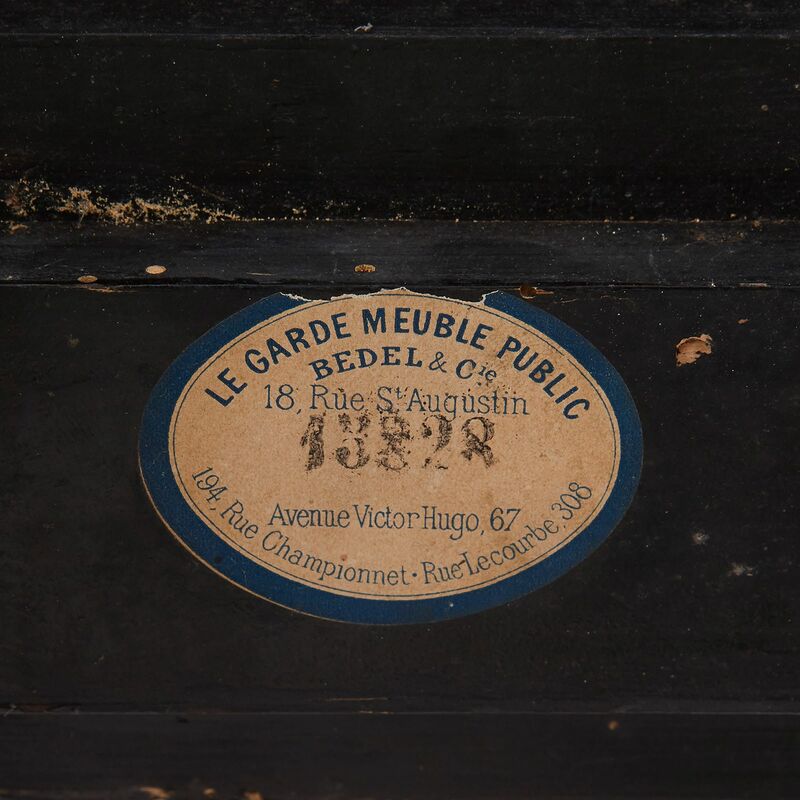 The powder is then fixed by a coat of lacquer, either transparent or coloured, and polished. Maki-e decoration can be made flat (hiramakie) or in relief (takamakie), and both are seen on this piece. ‘Togidashimakie’ ornament is also found on this cabinet. In this method, metallic powders are applied, then entirely covered with black lacquer. The gold and silver powders are then re-exposed by carefully sanding down the lacquered surface. This technique has been practiced in Japan since the Heian period (794-1185). It has been used in this cabinet to depict the glassy surface of water in the scenes containing waterfowl. 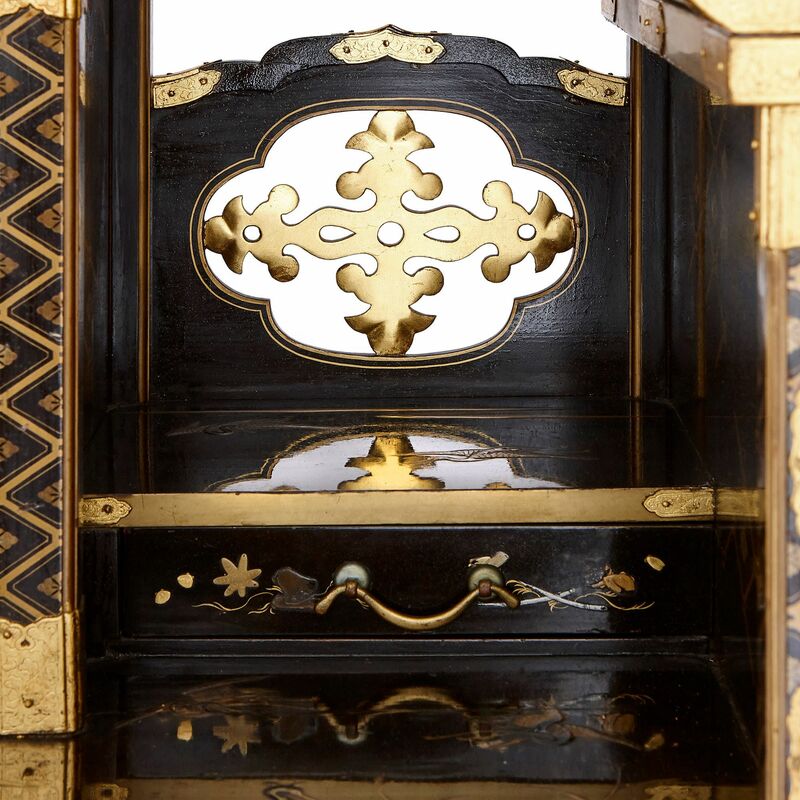 Other areas of the cabinet body have been covered with gold foil, and in detailed sections, gold and silver foil have been carefully applied using a technique known as ‘kirikane'. 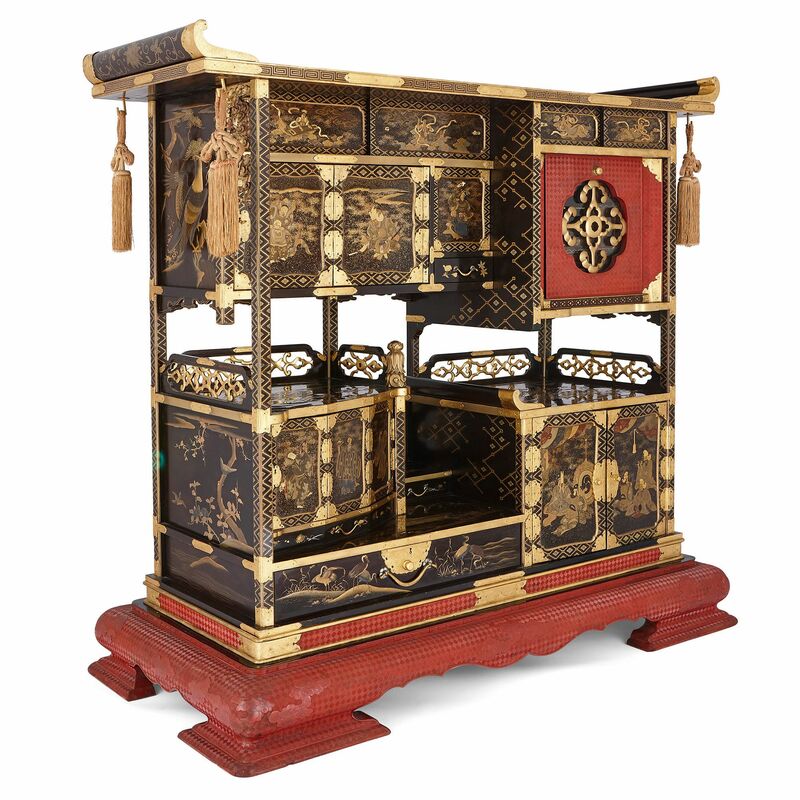 A team of skilled craftsmen and artists would have been involved in the construction of this cabinet. 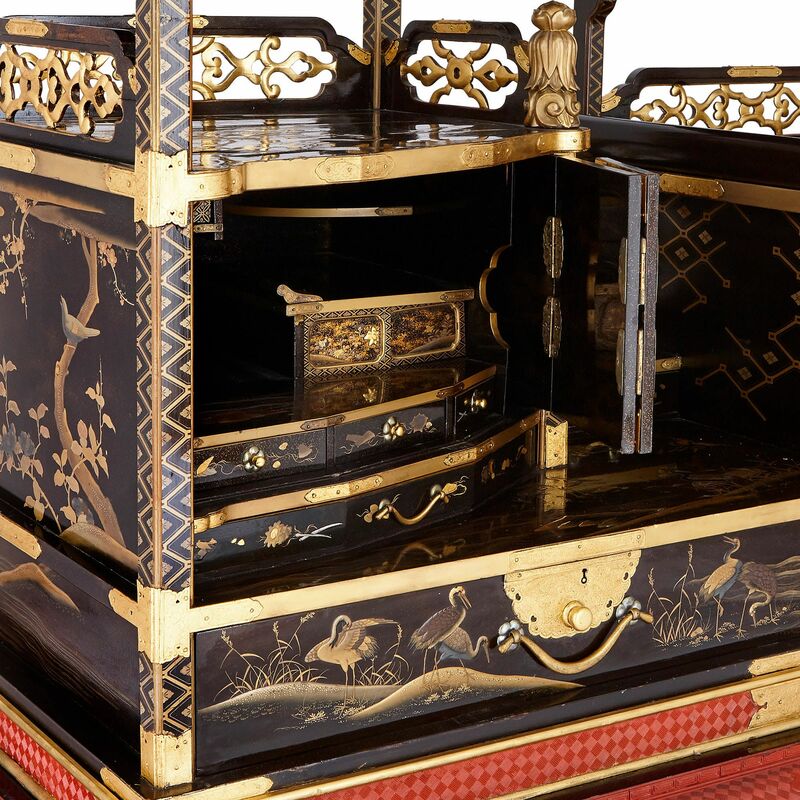 It would have employed a ‘sashimonoshi abil’ (cabinetmaker), a ‘nurimonoshi’ (lacquerer, who applied the bottom coating), and a ‘makieshi’ (decorator, specially trained in the art of maki-e). This cabinet is truly a masterpiece of collaborative design.